Don’t worry about the heaviness of your earring anymore, forget about droopy earlobes and elongated piercings. Levears’ patented Earring Stabilizer Technology lifts your post earrings upwards, regardless of their weight. Seriously, you can wear any oversized, bold, statement earring you want. From jewel-encrusted chandeliers to larger-than-life runaway trends to shoulder-grazing creations, they’re all yours for the taking. But before we dive deeper into the technology behind Levears, did you know the world’s largest pair of earrings weighs a whopping 2.2 lbs? India’s GRT Jewelers designed the 22-carat gold earrings in the traditional “jhumka” style pricing the one-to-two feet ornaments close to $50,000. So what’s the secret behind Levears? They have a precise “Right Ear” and “Left Ear” side, each with a structured curl that you can adjust for an ideal, lifted earring on each ear. Your earlobes won’t sag, and your post earrings will sit upright for face-framing perfection. The one-piece Levears are easy to grip, and look as good as the earrings they’ll be securing. You can choose from a variety of high-quality materials such as 14K gold for your finest jewelry to nickel-free sterling silver for a more casual look. The best part is that you can really shop for your favorite pair, without having to worry about damaging your earlobes or worse splitting them in two. Plus, they’re specifically-designed to fit the standard-sized posts used by most fine jewelry manufacturers. Get ready for some serious accessory shopping, there’s nothing stopping you now. Rebecca is a collection of quality Italian earrings making fine design and high fashion accessible. Their versatile styles are wearable, with creations for nearly every woman’s lifestyle. We sat down with the team at Rebecca, and asked them some questions regarding their process and inspiration. Rebecca is inspired by the world around us. We observe our surroundings and reflect them in our designs of each of our collections. This is why Rebecca jewelry is always meaningful; even in the most minimalist look. Rebecca means femininity and character, always with a touch of fashion. Our brand has developed adding value to non-precious materials and our style differs from that of other brands because it always brings with it the classic appeal of the jewel and its royalty, but with a touch of modern style. It usually starts from an inspiration, an idea born during a trip. What we look for in each new design is how to best enhance the features of a woman. Embellish without weighing it down. It is difficult to choose a favorite. We have created a pair of earrings for every occasion. We can choose a light design for a day at the office, like the one from our last collection ‘Copenaghen’ or ‘R-Zero’. For an evening out look, we can be more sophisticated with stones such as the earrings in the ‘London’ or ‘Hollywood Stone’ collections. 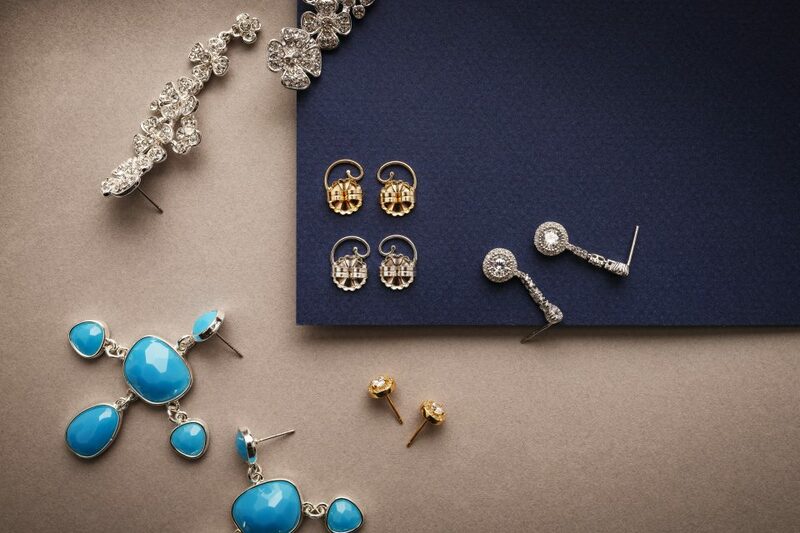 Earrings are a very personal accessory, perhaps even more than a necklace or a bracelet. Women have different preferences; some prefer longer and bolder options while others prefer studs or minimal earrings even for the most elegant evenings. They define the style and personality of a woman. For a limited time, we are featuring some of our favorite Rebecca earrings, paired with Levears. To shop, click here. When you think of cosmetic surgery, ears aren’t really what comes to mind. Most people think breast augmentation, rhinoplasty and facelifts. But the appearance of your ears, or earlobes, makes a huge difference in how you look, especially as you get older. Loss of collagen and volume, misplaced or stretched out piercings, even just the regular wear and tear from heavier earrings, can take a toll on your earlobes leaving you with a less than desired look. So what are the most popular ways to handle or better yet, prevent ear damage? Oversized earrings look great when your earlobes are tight and voluminous, but as you get older, they lose collagen which makes it harder for them to hold statement earrings securely in place. To prevent damage (or further damage) to your earlobes in the most affordable way, try Levears with its patented Earring Stabilizer Technology that lifts post earrings upwards for a more confident, youthful look. Levears has a structured curl for each ear, the right and the left, which you can adjust for your perfect fit, because no two ears are alike. Your favorite studs, chandeliers and oversized tear drops will sit upright, face forward (instead of sloping down) regardless of their weight. Levears Earring Lifts come in a variety of high-quality materials from 14K yellow gold, sterling silver and even tarnish-resistant stainless steel. Some people go for the same surgery that repairs splitting, which is when the earlobe actually splits into two. For them, it’s less about droopy earrings. But why go for such an extreme solution, when only dealing with mild sagging? This means repeated visits to surgeon, local anesthetic, re-piercing, risk of infection and over six weeks of healing. Did we mention a $400 to $900 price tag depending on where you go? Finally, a third way to deal with sagging earlobes is with fillers. To restore the appearance of earlobes, people visit their dermatologists for Restylane or Juvaderm injections. For fuller, more plump earlobes, patients pay about $500 to $600 per syringe for younger-looking earlobes that last anywhere from six to nine months. Earrings are a great way to frame your face, add attention to your best features and show off your personality. But with so many options out there, how do you know what best fits you? Don’t worry, we’ve broken it down for you in a simple diagram and even added some hairstyle ideas for a complete, enhanced look you can feel confident in. Oval faces feature foreheads as wide as cheekbones and can pull off practically any type of post earring. Dangle earrings look especially good, drawing attention upwards without too much width or length for a great balance. An updo looks great with this style combo, perfect for any special occasion. If your face is more on the rounder side, its widest point is across the cheekbones, so post earring teardrop styles look best. They can add drama, elegance and femininity to your face. As far as hairstyles, think sophisticated buns, soft pony tails and braids. With rounder faces, studs aren’t a good fit. There isn’t a lot of narrowing happening in square faces, which means jaw, hair line, chin and forehead all make a square. The most flattering earrings boast dimension as well as elongated and dangling features. Exaggerated shapes such as angular or rounded edges help soften the face too. The long bob a la Keira Knightely or layered, flat-ironed hair like Gwyneth Paltrow looks great on this type of face shape. Heart-shaped faces get narrower toward the chin, earrings that are wider at the bottom create more balance. Tear drops are great, chandeliers too, but no studs for this face shape. For hairstyles, think blunt, wispy bangs, shoulder-length loose waves or a sleek, stylish sleek crop. Prominent cheekbones scream diamond face shape. The forehead and chin are narrower than the center of the face, so soft dangling long earrings look best. Deep side parts, layers, and hair behind your ears are the best styles for the chiseled features. 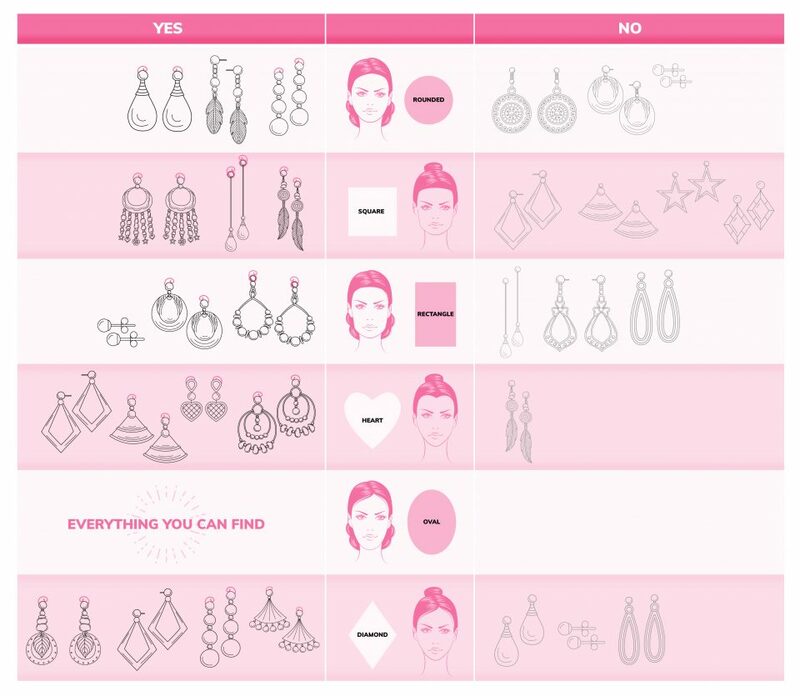 So which earring style is best for you? Move over Cupid, February was all about fashion with Fashion Week taking over New York, London, Milan and Paris. Designers, magazine editors, celebrities and TV personalities peppered star-studded front rows for a closer look at the latest trends parading down the runway. Vogue’s very own Anna Wintour even seemed to use the occasion for a new friendship with Rapper Cardi B during Alexander Wang’s New York show. From solid reds to leopard prints, from looser silhouettes to every iteration of the nineties’ windbreaker, and tulle like you’ve never seen it before, fashion trends of 2018 were loud and proud. But what are the biggest fashion trends this new year? That’s right the big, bold and oversized earrings have made a comeback. Even Pinterest, back in December of last year, knew the statement earring trend was going to be big in 2018. 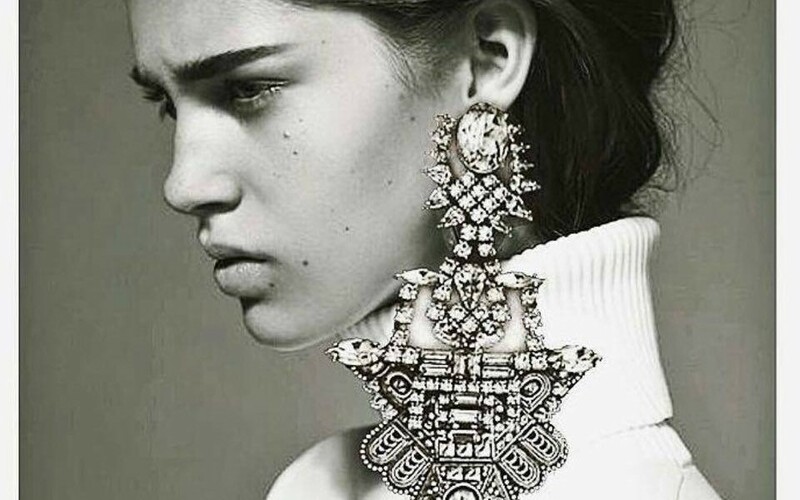 This thanks to over 200 million Pinners worldwide and a 947% increase in saves for “structured statement earrings.” Fashion Week 2018 boasted oversized earrings of all kinds, from shoulder-grazing sculptures to dangling masterpieces, by Valentino, Etro, Christopher Kane, Emporio Armani, Burberry and Topshop, just to name a few. For those of you who are thinking, “I can never wear statement earring, they’re too heavy” think again. With Leavears Earring Lifts, you can put on your favorite pair of massive post earrings for full support so you never have to worry about stretched piercings. Seems like the one-piece trend is here to stay, but 2018 brings a modern twist to the beloved jumpsuit or its shorter version, the romper. This year, the fashion runways were filled with a boxier, looser, more boyish silhouette to them. Tod’s, Gucci, Sportmax and Public School all featured their versions on the jumpsuit. Sportswear even got in on the action with Dior, Fenty X Puma and Marc Jacobs versions of the athleisure jumpsuit. Jeans are a staple in everyone’s wardrobe, so it’s no surprise high-fashion denim is in this year. Think embellished, bedazzled, embroidered or sequined. From Gucci to Alice + Olivia to Michael Kors, it’s intricate stitching, beaded details, and rhinestones everywhere no matter the jean cut.